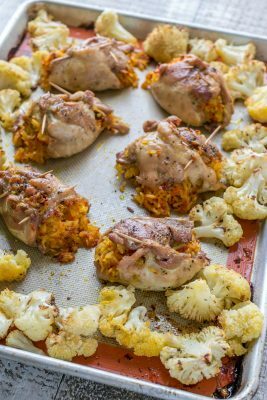 These baked cheesy rice stuffed chicken thighs are so flavorful, tender and frankly just a great chicken recipe! These reheat really well the next day. Think: work lunch! Line rimmed baking sheet with parchment or Silpat. Preheat oven to 350˚F. Start by cooking rice: In a medium saucepan, bring 1 3/4 cups water to a boil. Add 1/2 tsp salt and 1 cup rice. Reduce heat to simmer, cover with tight fitting lid and simmer 15 min or until water is absorbed. Remove from heat and and keep covered. While rice is cooking, place large sauté pan over medium heat and add 2 Tbsp butter and 2 Tbsp olive oil. Add grated carrots and diced onion, season with 1/2 tsp salt and sauté 8-9 min or until soft and golden. Stir grated cheese into the hot rice then stir in the sautéed carrots & onions. Set aside to cool slightly while prepping chicken. Trim chicken of excess fat and arrange on cutting board between 2 sheets of plastic wrap. Pound chicken until about 1/8 thick. Season both sides of thighs lightly with salt and pepper. Lay thighs smooth-side down. Make a ball of rice with your hands and place over chicken thighs. Wrap meat around rice and secure each thigh with 2 toothpicks. Place cauliflower on baking sheet, drizzle lightly with olive oil, salt and pepper and toss to combine. Push cauliflower to borders of baking sheet. Place stuffed chicken thighs in the center of the baking dish, drizzle chicken lightly with olive oil and bake in the center of the oven at 350˚F for 45 minutes. *We made 6 thighs but there is enough rice mixture to make 8 stuffed thighs if you want to make the bigger batch. Baking time would remain the same. **Carrot sticks or thick rings of carrot would also work, but I found that broccoli shrivels with these baking times.